View More In Brioche Pans. Silikomart was established in 2002 as a product of the experience and belief of its founder Dario Martellato. Silikomart offers a wide range of refined and innovative products, with a functionality, practicality and beauty which meet the needs of all those who love to cook. The company has continuously strived to offer its customers a superior product. For this reason, the whole production process is "MADE IN ITALY" and uses the highest quality commercial silicone (made from 100-percent platinum liquid silicone), which complies with FDA and CE food standards. Silikomart silicone products are completely non-toxic, odorless and tasteless and the liquid silicone injection process allows for incredibly detailed forms for baking pans and molds. 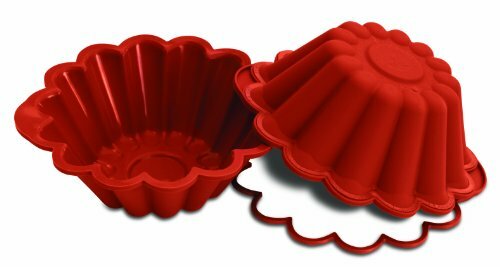 This combination of quality, safety and performance, along with their unique designs, makes Silikomart the leading specialist of culinary silicone use amongst professional pastry chefs. Silikomart silicone products are ultra flexible, they don't release smoke or odors when baking and they are resistant to cracks and aging. They can be used directly from the freezer to the oven, from-75-Degree F to +450-Degree F and they are dishwasher and microwave safe. The glossy surface ensures an easy release for all types of use. All silicone products are guaranteed for up to 3,000 uses. The Silikomart classic line of products offer diversity, flexibility and great stability. It features multiple shapes and sizes for those who love to choose and each mold is fitted with the patented safe ring to ensure stability and faultless results. This silicone brioche-shaped baking dish provides an easy and great-looking way to bake your favorite treats.